The T.L.C. 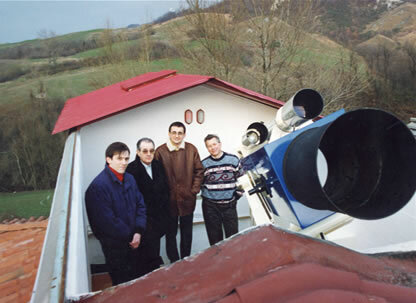 (Tito Lucrezio Caro) Observatory became active in 1990 on the initiative of Giorgio Marani, Stefano Orlandi, Enelio Pancaldi and Giancarlo Sette, all come from the Saint Vittore observatory in one way or another. 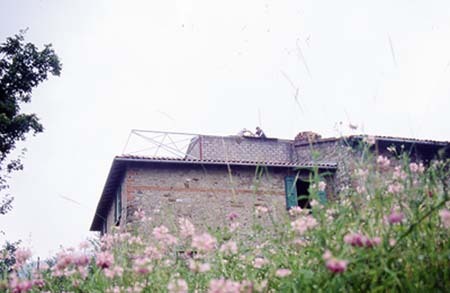 The observatory is situated on altitude of 300 m in a old country house made of stones, 30 km from Bologna center: an authentic ruin, but the sky over it, is good, it was worth building a sliding roof and adapt it to an observatory. When we began, the digital photography did not exist yet. Therefore we tried to organize the observatory's activity using traditional chemical photography. We had faith in Giancarlo Sette great experience, in the field, which he gained in many years of work as an amateur astronomer in Saint Vittore, and as a technician in a photolithograph company. Therefore we decided to construct a Schmidt telescope of 300/400/800, with a focal ratio of 2.7, really fast but not extreme, with optics made by Zen Optical Constructions. To complete the equipment we obtained various filters, a refractor 120/1500 for guiding, a tool in order to cut the films, and a device to hydrogenate them in a vacuum chamber at controlled temperatures. Moreover we supplied a room for printing on paper in format 50x60: a workbench for development, fixer and washing bathes, and a professional enlarger for great size. 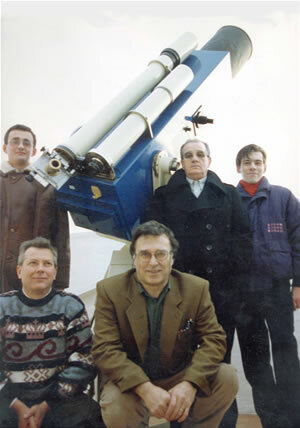 For construction of all this hardware we made use of the fundamental knowledge of Giuliano Nepoti, an excellent mechanic, enthusiast of astronomy and photography, that meantime had joined the group. 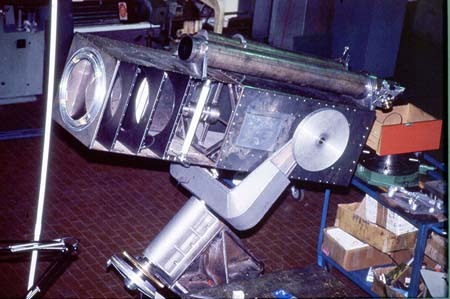 In summer 1991 the telescope began to work, and we began a really long series of tests and experiments to increase films sensibility using hydrogen on many kinds of emulsions, among which, of course, the Technical-Pan by Kodak, that at the end, appeared to be the best one for the photos with low levels of light. After that, we began a supernovae search in about twenty fields of galaxies. For two years every clear night, we were ready to photograph. No result, but you know in these searches luck is decisive. Very soon Fabio Muzzi joined the group, he was an amateur astronomer really enthusiast and he had just graduated in astronomy, and was a beloved friend. He contacted the Minor Planet Center, and our observatory was enrolled, for astrometric activity, with code number 600. However, not having micrometric comparator, the real astrometric activity began only after several years, when the commercial image scanners became affordable. The image scanner made it also possible to convert several images that were taken in single color, red, blue and green, in digital format, images that we had obtained in the previous years. At the end of the 90's the observatory activities were decreased for several reasons, and astrometric observations of asteroids was resumed just in 2003. In those years the digital photography was advancing in great steps, and Kodak decided to stop the production of the Technical-Pan. Hard times, all our work methods and all our instruments became outdated in front of the advancing technological revolution. We began a long term of optical studies and discussions about the best thing to do, with the involvement of two passionate friends expert in astronomical photography, Ivano Ferri and Umberto Bonori . So as the progress should be accepted, and greeted enthusiastically, we decided to convert all the existing instrumentation to digital, and so we have completed this conversion in these days, at the beginning of 2008. In order to contain the costs, and also because we are still inexpert in this matter, we decided for the time being to use a modified Canon 350D, put on the focus of the Schmidt camera. We believe that the strong brightness of the instrument, will consent short exposures, and will allow the use of not cooled sensors. This is an expedient, but the cost of a Canon 350D is 15 times less than a CCD, and this fact is surely important. In these days we are discussing the program of observations, and we are counting on resuming the activity within two months. In the future, we plan to furnish a more useful instrument with a greater focal length and with an external focal plan that allow the use of filter wheels. All that will take a long time, but, for this purpose, a new mount which is more sturdy is already under construction and it will be adequately computerized.